Hi All, I’m relatively new to the Plumbutter world but I wanted to share my initial experience with others because the simple repair work I did this weekend has just brought a whole new life to my PB2. Basically, like everybody else, it takes some time to figure out what is happening when you are patching. I mean the instrument is well known for its unpredictability compared to so called ’traditional’ synths – this is clearly part of its charm and appeal. I totally get that. That’s why you get one! For example – you would expect those purple FM inputs to give you some type of FM modulation when a jack is plugged in – but because the knob already changes the sound on its own, and differently depending on the direction of turn, I couldn’t be sure I was getting a result. Basically I wasn’t getting a result! Rollz – I knew I should be able to mix things up with the browns to effect the rhythms if I connected them together – but for me several of them did nothing when connected. Blue Verso and Inverso jacks – ditto there, some of them seemed to do nothing no matter how hard I tried with them. For a while I thought it was me, then I noticed that some jacks responded if I wiggled them juuuust right, or pushed the nana in part way only. So finally I decided to take things apart and have a look. It is very easy on the PB2 to unscrew all the front screws and then just pop out the front section and PCB from the base to reveal the board in all its glory. If you look at the picture here you can see that the soldering looks fine on the Jack I'm pointing to - Nope, actually there is no electrical connection. The reality is I had at least 8 (yes EIGHT !!) jacks that were not connecting properly thru to the PCB ring around each hole. Presumably a cold or cracked joint? I pulled out the multimeter and soldering iron and tested every one and resoldered the faulty jacks – it was easy as pie to do. Put it all back together and it works like a dream come true – suddenly things work like I wanted them too. Motto of the story – if you are having any of the problems I described, or if any of your in's or out's don't seem to respond - then don’t be afraid to pop it open and fix it yourself. I can’t believe how much more fun I’m having now. I had the exact problem happening to me on my Plumbutter V1. I fixed 10 jacks by resoldering them. Mr Blasser doesn't put enough solder on the lugs. I'm told the reason being is so its easier to fault find and unsolder if theirs an issue. I thought it was just on the older models and am surprised its still happening on v2 models. I think it also matters which type of bananas you use. I used Pomonas and they are tighter fitting than others and don't help the issue. All ends well though. Hey Cobramatic, can you please tell me if you had to desolder the connection first? I'm new to soldering but I have a Gongue whos banana jack is working only about 10% of the time. Hoping to not have to buy a lot of supplies for this, but want it to turn out right. Then again, I do have some Easel cards to try to solder, so perhaps I should just get a whole kit. I had to do this on my P.B. 1. All you need is some fresh no-clean solder. Just heat and re-flow with new solder. Read up on soldering electronics first, if you don't have experience. Plenty of discussion here in DIY. Thank you for the advice. So I don't need the fancy desoldering pump or braid? Cool!! I'll give it a go! Just got a PB2. Hopefully I won't have issues, but if I do, I can refer back to this thread. Thank you for sharing your experience. At first, I tried to get the solder that was already there flowing, but that must not have sealed the deal. So I added a tiny bit of new solder and that did the trick. Program cards, here I come! That's also the trick when you desolder things, add a bit of new solder, that makes the old fluid. Good to hear that you did it....have fun! thanks! I had same issue on an FM input on an avdog. after a little bit of panic, I found this thread. I just fixed it, working perfectly again. 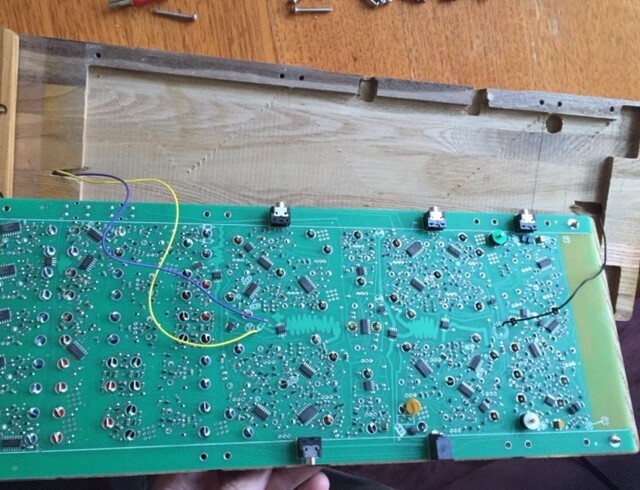 This might be better suited to the DIY subforum, but I figured I'd ask here since I'm about to try fixing a faulty jack on my Plumbutter 2 this afternoon. I've watched a few videos on through-hole soldering, but I'm left wondering -- are there are any tips and tricks to reflowing/fixing a joint on a banana jack specifically? The hole is rather massive, and I'm wondering how I can make sure the connection between the bottom of the jack and the board is as good as possible. Thanks for entertaining these incredibly newbie questions! 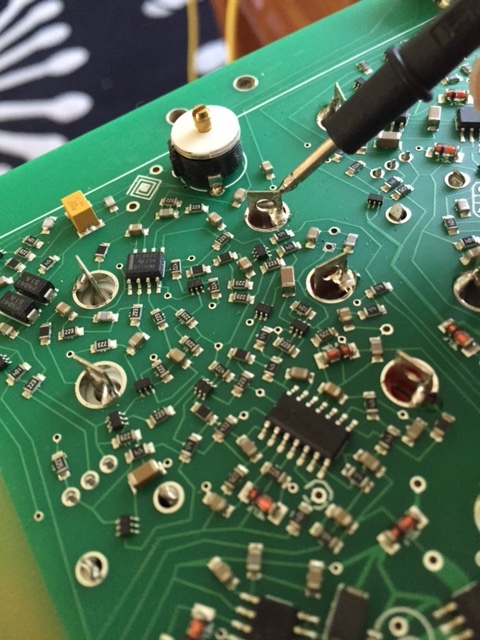 There is a surprising lot of details in doing any solder repair, that might catch up a newbie to soldering. I would suggest looking at some basic electronic soldering videos to learn about types of solder, temperatures, tinning the tip, etc.. Then practice on something you can throw away. Once you get the hang of making a good joint, and knowing that you did, then try your repair. If you don't have time to do that, then here are a few tips. Use a 700 degree tip, preferably from a temperature controlled soldering iron. Use no-clean solder. I prefer to use lead based, rosin core solder, but it's harder to find these days. Tin the tip. Then apply the tip, so that it is touching both the side of the banana jack terminal and the ring on the circuit board. Apply a bit of solder (the right amount is learned by practice) to that point where the tip, the jack, and the PC board all touch. Let it flow, which usually takes no more than 5 seconds. Then remove the iron. The joint should be shiny. The solder should look smooth. Be prepared with some solder wick to remove too much solder, if that happens, and then flow again. pugix -- Thanks so much, and sorry for the slow reply! I tried to fix this jack, but alas, my skills weren't up to the task. I tried reflowing the existing solder a bit, and when that didn't work, I tried adding a bit more to no effect. My hunch is that I added too much, and I'm without the tools to remove it. It's a bit of a bummer to start with a broken jack like this, but I'm sure I'll be able to get Peter's help. I think I have a similar problem with one of my gongue jacks. I assume I will need to remove the knobs before I can open the pb2 - right? What procedure is recommended? Just pull? no need to remove the knobs. just remove the screws and open the case. Thanks for the answer, jimmie. I had the same problem with mine. Still think some of it is wonky. Probably need to go through it again. Could someone please explain the process of testing the jacks with a multimeter? I have one jack I'm planning on re-soldering once I get my skills up to par, but would be interested in knowing the others are all functioning correctly.